I didn't add the pictures from my holiday that I thought I would....some I added to facebook, but I'll get to it. I've decided this year, to be kind to me. These past few days since New Year's have all been quiet contemplation.....not so much new year's resolutions but just an awareness of what I need. You see, every year I make resolutions, like most people I guess, and every year I hear the same words echo in my head.........failed, failure, useless, can't, hope, might, never, wouldn't, shouldn't,......and although I consider myself a fairly 'glass-half-full' kinda person, this was a bit of an eye-opener for me - I'm really positive to others, but so hard on myself. So, instead of the 'lose-30kg-in-6-months' diet I plan EVERY year, I'm learning about why I sabotage myself when I do lose weight and try to understand why I have the mental thumbscrews on so tight. The 'I-will-have-this-house-neat-as-a-pin' regime I start off with gusto EVERY year, I'm planning to do one or two jobs each day, and be satisfied with doing those well, knowing I'll get there in the end. And the 'get-rid-of-all-those-ufo's-in-my-craftroom' resolution I have EVERY year, well I know that's not going to happen, so I'm not going to beat myself over the head and I'll just plod along, being happy that they are getting done, one step at a time. I'm going to BE KIND TO ME in 2017. I figure if I'm kind to me, then the flow on effect will be amazing! I've known for a while I have food issues.......I grew up in a time when 'you can't leave the table until everything on that plate is finished' or 'think about all the starving kids in Africa', and never mind the 'there'll be no dessert until you eat everything on that plate', or 'you'll go to bed without any dinner then' was commonplace. Hence, 40+ years on, I have issues.....well, really I've had them all along but I'm aware of them now and where they stemmed from, but they're so deep-seated....how do I address them, where do I start? Emotional Freedom from Food, A Year to Clear What's Holding You Back, and Clear Your Home, Clear Your Life. There are hundreds more, so I'm sure these are going to be my 'go-to' this year for that quiet 'tap on the shoulder......Wendy, really?!' moment. I'm making a point to 'be kind to me'. What about your craft room you might ask? 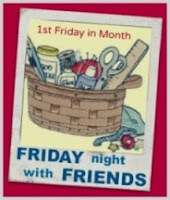 Well, I'm starting off the year with Cheryll tomorrow night with Friday Night With Friends. If you want to join in, pop on over to Cheryll's place and link up. The light is always on and the friendship is truly warmer than our Queensland summer days! And that's just the start. I'm planning on spending more time stitching with the people who make me laugh, cry, swoon, love - people who make me happy. Want to join me? What a wonderful resolution to make! I am also doing a year to clear with the Daily Om. I think we lived the same childhood. LOL In addition, I never had to worry about what I ate or how much, until I turned 40. I can't seem to get the hang of it even now. My mother made me be neat as a pin, and I hate it, so now I'm sloppy! I've decided to be happy with who I am. You know that sweatshirt - Ewe's not fat, ewe's fluffy? That's me! =) Best of luck in changing what you want to change, and accepting the rest. Love you, Wendy, just the way you are. Good for you, Wendy! If you aren't kind to yourself, how can you expect kindness from others!?! You are a beautiful, generous person and I'll bet you'll find a lot of ways to go easy on yourself! You actually do deserve it!